As we all know, the battle is the core of Lords Mobile, and then troops play an important role in the war. This guide(written by eraser) is talking about TROOPS. Join it! For those of you who just started or learned about this game, Lord’s Mobile is not a game of peace. It is a game of WARRRR!! The objective is to be a member of the strongest guild and BURN all others. Without troops, this would be impossible. Lord’s mobile consists of four different troops. Infantry, Ranged, Calvary, and Sieged. There are also four different tiers for each troop. Here are our basic troops. These are the weakest and do not require any research to unlock them. Here are the tier 2 troops. They are unlocked through researching in the Academy. These troops right here are the bread and butter of this game and where most players tend to be. The last but not least tier 4 troops are incomparable to the previous three tiers. However, they require a lot of effort to achieve as they are the last to be unlocked and there are a lot of requirements such as research needed in order for them to be unlocked. Now that you have an overview of what troops exist, let’s start training! Barracks are where troops are trained. 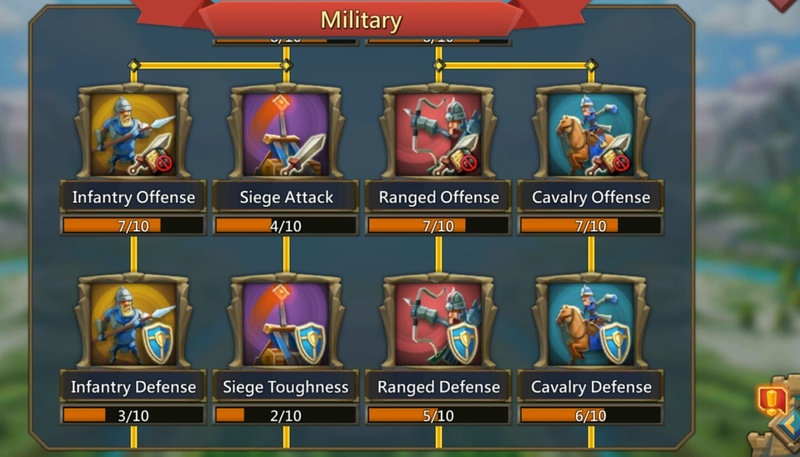 Depending on the barracks level, the higher the barrack, the more troops you can train. REMEMBER: The more barracks you have does NOT mean that you will be able to train multiple troops. It only increases the number of troops you can train at one time. For example, let’s say you are training 1000 infantry in your barrack, building a new barrack will let you increase that amount, not allow you to train a new set of 1000 infantry or other troops. 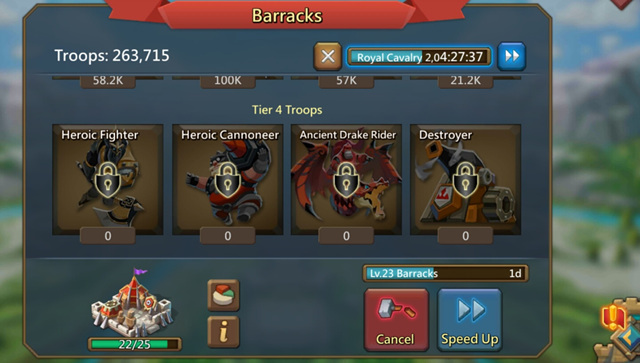 Below shows the number of troops you can train depending on your barrack level. As you can see, you do not need two barracks. As you can see, I have all t3 troops. My infantry and calvary are pretty even, then my ranged is about double the amount, and sieged is about half the amount. The reasoning behind training troops evenly is because they each have a counter. Easiest way to think of this is Rock Paper Scissors. There is no dominant troop type. However, I just prefer having more ranged troops as they tend to be safer due to being in the back line. ALWAYS BE TRAINING TROOPS. Whenever I train troops, I make sure to check how long it will take and think ahead to see if I will be available to train more troops as soon as possible. If I am about to go asleep, I would train max troops, which takes about 9-10 hours. I can sleep in peace and wake up to 2000 more t3 troops! Another aspect of Lord’s mobile that is crucial is troop count and infirmaries. Infirmaries are buildings where you can heal wounded troops that were injured in battle. 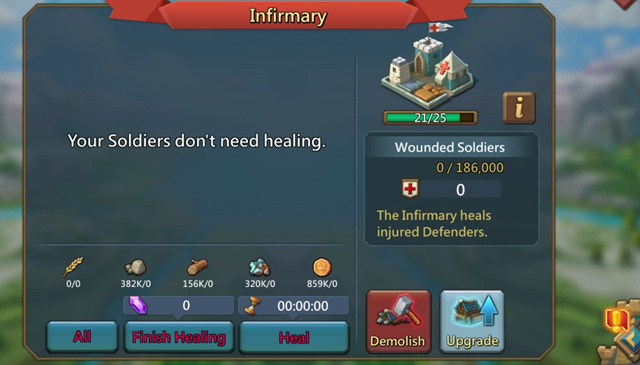 Depending on the infirmary level and how many infirmaries you have, you will be able to heal more troops. ALWAYS HAVE ENOUGH INFIRMARIES TO COVER YOUR TROOPS. This is extremely important and I tell my fellow guildies every day. If you do NOT have all your troops covered by infirmaries, you will LOSE, I REPEAT, LOSE not WOUND, a LOT of troops if you get into battle/war. As you can see, I have more troops than my infirmaries can hold. If I were to get attacked, I would lose an of troops. However, there are four ways you can protect your troops. First, the most basic would be to use the Shelter! It is completely free and you are able to send troops and your hero leader to safety. Whenever you are not online, I recommend sheltering your troops, as it is the safest method of keeping them safe. The second method would be to use a shield. As this is a war game, we are able to purchase shields that can protect our castle from being attacked/scouted. With this on, you would not have to worry about being attacked! Another method similar to sheltering would be to start a fake rally. However, this method is used more for hiding troops when in battle rather than trying to protect them. Last but not least would be to send reinforcements to a guildmate that already has an active shield. This way, your troops will be protected as long as your ally has their shield up. There are several ways to increase training speed and reduce the amount of time we have to spend waiting for fresh recruits. 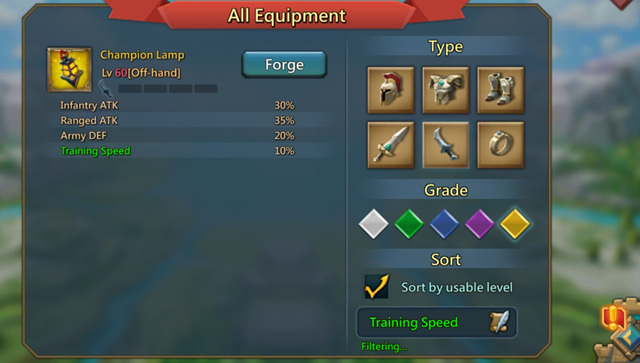 As you can see there are two categories of training speed that can be upgraded via talents. Maxing out training speed I and II is the most simple and effective way of increasing training speed. 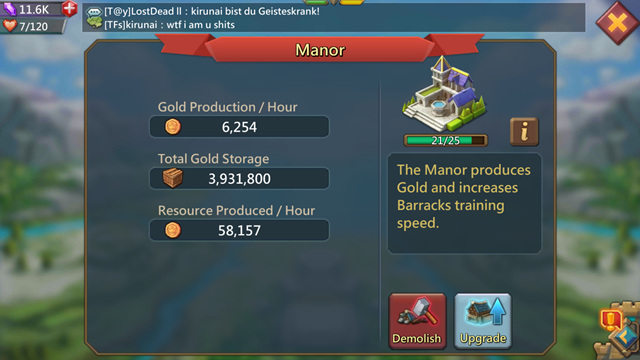 As you can see above, manors increase training speed (at lvl25, 20% increase). It may not seem like much but, remember that you can build several manors. The only problem is that manors and infirmaries use the same space. There are sixteen total spots that you can build infirmaries and manors once you unlock the skirmishes. I recommend having enough infirmaries to cover your troop count and fill the rest with manors. As you progress and your troop count increases, you can decrease the number of manors you have. The standard that many players are currently using is 8 manors and 8 infirmaries. Last but not least, there are three heroes/heroine and one equipment that helps increase training speed. One hero that can increase training speed is Witch Doll. She can be purchased through the in-game store with MONEY. She is very expensive to get to gold but she has the best skills. Increase in construction speed, research, AND training. Currently, this is the only equipment that helps increase training speed. The Champion Lamp. Materials for this equipment can be purchased through the store. If there is more information you would like, feel free to comment and let me know.